Personalized Military We Support Our Troops Address Plaque - - contains a full-color United States Marines, Navy, Army, Air Force, or Coast Guard medallion and a banner that reads We Support Our Troops. Available for either wall mount or lawn mount. Proudly made in USA just for you. Holds one or two lines of your personalization. Personalize with your own custom quote, family name, house numbers, or whatever text is meaningful to you. One line plaque holds up to eight 3" characters of twelve 1.75" characters. Two line plaque holds up to sixteen 1.25" characters on line 1 and up to sixteen 1.25" characters on line 2. If not using two lines, please leave the line 2 input box empty. 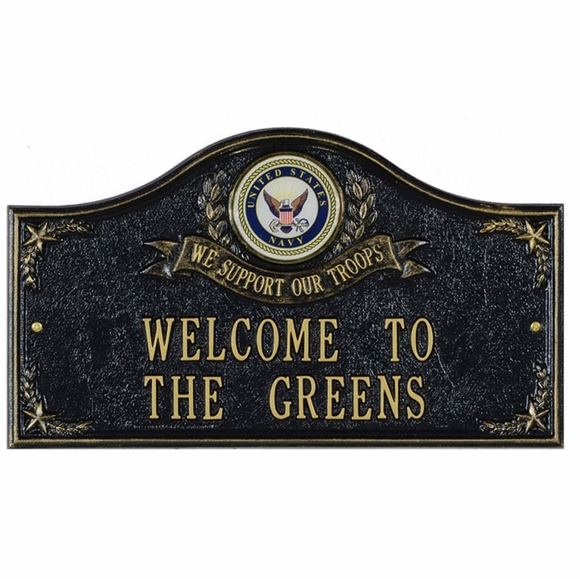 Display your pride in the United States military at the entrance to your home or business. Beautifully handcrafted service medallion plaques are made from durable, rust-free, recycled aluminum. Plaque size: 16.21"W x 9.5"H. With lawn stakes total height is 25.5". Colors: bronze background with gold letters and trim OG; black background with gold letters and trim BG; and antique copper AC. Custom made for you in the USA. Full-color U.S. military medallion plaques are made to withstand outdoor elements and retain their vibrant colors. How big is the medallion?